Fluxiom will be unavailable for around 30 minutes on Wednesday, December 10, 2008, 6am GMT for system maintenance. Thanks for your patience while we continue to improve fluxiom for you. Update, December 10, 2008: fluxiom is up and running again. Thanks for your patience! Tags are one of the pillars of the fluxiom experience. With tags, you get a layer of near-infinite flexibility in how you combine, traverse and group your assets. As part of our recent back-end upgrades, we have introduced a new, more reactive, mechanism that now updates tags on-the-fly across the entire interface. Whenever you add, rename or remove tags from your fluxiom account, changes will now immediately be reflected across the board, in all parts of the interface. That means you will have even fewer reasons to reload the page over the course of your day and will, therefore, enjoy an overall smoother, more efficient workflow. As always, we’ll keep on sweating the little details for you! In the meantime, we very much welcome your comments, questions and feedback, on this feature and on any other aspect of fluxiom. We are proud to announce that today we dropped the storage limitation within the 30-days-free-trial period. 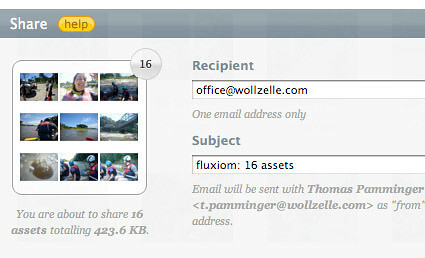 This means that after signing up for a new fluxiom account you instantly gain the full storage capacity. We hope this update helps our new customers explore all of fluxiom’s features seamlessly during their trial period. Sign up today. As always, we will look forwards to hearing your thoughts and comments. This the second step of our two-step fluxiom backend improvement. We will set the additional hardware we added the other week into operation. We just setup a Twitter stream for fluxiom at twitter.com/fluxiom were we will post status updates and occasional links to interesting posts. Today we launched a set of improvements, some interface refinements are obvious but there were also a bunch of under the hood refinements. We adapted the thumbnail preview in the tag and share panel. 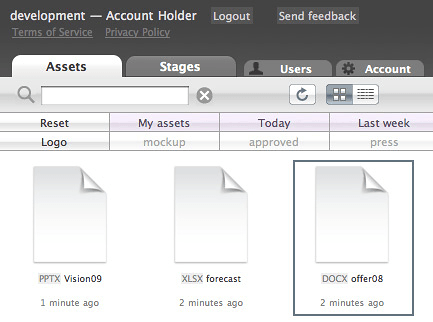 You now see a preview of the assets (the first nine) that you are about to share or tag. The badge in the top right corner indicates how many assets you are about to tag or share in total. We already introduced this preview for the stages. 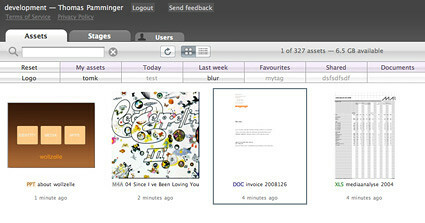 By popular request we changed the appearance of the “manage tag” button to make it more prominent. We also pushed a series of improvements and maintenance updates. They’re little things, but they make a big difference. ZIP download significantly faster: We speeded up the ZIP generation, so when you select many files or hundreds of megabytes for a download the ZIP file will now be prepared in just a few seconds and the download starts instantly. upload progress bar was gone: Due to the latest server update the progress bar for indicating the upload progress was gone, the files were uploaded but the progress wasn’t displayed correctly. This is fixed now, we apologize for the inconvenience! We hope you like this new updates! We’re still in the progress of further optimization to improve the experience. Next to some under-the-hood improvements we launched an update last week and increased the file storage space for all fluxiom plans. The fluxiom widget leverages the branding settings from your fluxiom account to provide a well reached cohesive brand identity. Learn more on how to personalize your fluxiom account. 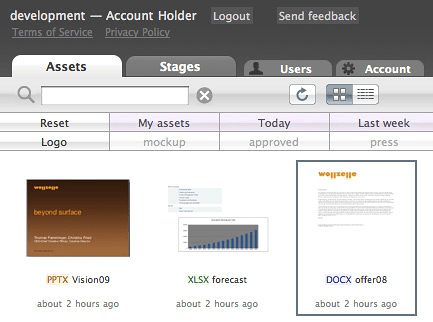 IMPORTANT NOTE: To use the fluxiom widget you have to make sure that the API is activated for you fluxiom account. The fluxiom widget is based on the fluxiom API that allows programmers to access/read/write fluxiom data from third-party systems (eg web-based/desktop products, back-office systems, OS X dashboard widgets, Yahoo/Confabulator widgets, …).